Angkor, capital of the Khmer empire from the ninth to the fourteenth centuries, is one of the most remarkable historical sites on earth; a vast area of superlative ruined temples, city walls and ceremonial areas. The city was only rediscovered in the late 1800s, and many of its temples are still in the grip of the jungle, slowly dismantled by giant strangler figs. Walk from Angkor Wat through the heart of the Old City. Pace your walk carefully to cope with the heat and avoid the worst of the crowds. The glorious city of Angkor, larger than any city in Europe at that time, formed the heart of the Khmer empire at its apogee in the 12th Century. Angkor Wat, south-east Asias outstanding religious building, a temple of such magnificence of scale and imagination that it sits comfortably with the worlds great buildings, had been completed around 1150. From the late 1180s, King Jayavarman VII had started building the monuments that gave Angkor its final form, including numerous major Buddhist temples to reflect the recent supplanting of Hinduism as the state religion. Founded in 802AD, the Khmer civilisation seemed to appear very rapidly, apparently almost from nowhere. Indian influence had followed the trade routes along the south-east Asian coast, shaping the art and culture of that region, although Khmer art and architecture evolved their own, highly individual styles. It oscillated between Hindu and Buddhist royal allegiance, a prime source of its architectural richness. Visitors to Angkor seldom walk between sites; the heat, distances, tight timetables and short attention spans result in a scurry round the sites in cars and buses, on mopeds and bicycles. Much better and more atmospheric is to walk - after, perhaps, a day of orientation. Cambodia is hot all year; go in the cooler dry season, and start early in the morning. Our walk follows the ancient route from Angkor Wat through the ceremonial heart of Angkor Thom, the imperial capital, passing many of Angkors greatest monuments on the way. Start where the road from Siem Reap, the nearby dusty little town, meets the mighty 5km moat of Angkor Wat. Across the southern side of the square moat, something like 1.5 km long and 200m wide, the wall of the temple can be seen between pine trees on the cleared bank. Rather than head towards the grand entrance, though, an alternative and better route, which we walked the next day, is to begin by walking anticlockwise around the moat, entering the temple grounds by the rear entrance. This is a longer walk, but much quieter, and the early air is pregnant with ghosts and echoes. Cross a plain, wooded causeway, and climb through a lovely dilapidated gatehouse. 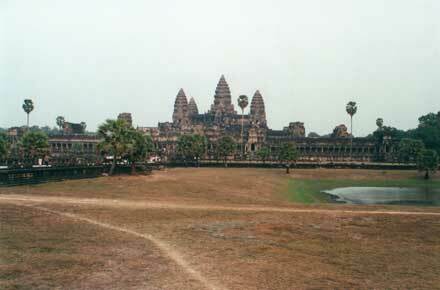 Behind, a straight drive leads half a kilometre or more to the back of the great temple, which looms at the far end. Circle the temples famous gallery of bas-reliefs, past the churning of the Ocean of Milk (one of the greatest scenes ever sculpted in stone), and out through the grand main gates. Leave by the grand entrance: a finely constructed causeway leads from the entrance gate, three towers in the middle of a superbly balanced portico some 200m long, out across the moat. Looking back, the five great central towers of the temple soar behind the gateway, their harmony and balance disguising their 200ft. height and the distance from the entrance. You are now on the great avenue, which runs for more than a kilometre through the forest, through the magnificent south gate of Angkor Thom to the Bayon, the great Buddhist temple at the heart of the city, walking along a wide, grassy verge among fine, straight-limbed tropical trees. On the left looms the hill of Phnom Bakheng, a dusty path clambering straight up its steep side. At the top, invisible from the road, is the eponymous five-tiered Shiva temple mountain dating from the 9th/10th Century cusp. It commands a superb view of Angkor Wat across the treetops, best seen glowing in the late afternoon sun. A hundred metres further, among the trees to the left, is the immaculate little Shiva temple of Baksei Chambron, a thousand-year-old tower of mellow brick on a four-tier platform of warm brown laterite. Its green sandstone doorways and lintels are astonishingly fresh, and include a delightful Ganesh, the elephant-headed god, riding a mount formed from his own trunk. You will now reach Angkor Thom, Angkor The Great, the last capital of the Angkor era and more magnificent than any contemporary city in Europe, with a population which was perhaps pushing a million behind its 9km (nearly six mile) long moat and wall. A causeway lined with extraordinary stone statues leads across the 100m. moat to the great South Gate. On each side, 54 oversized figures - gods to the left, demons to the right - support the bodies of huge nine-headed nagas, protective snakes, which rear their heads at the outside end of the causeway. Like a tragically large amount of sculpture from Angkor, many of the figures heads have been stolen, although some have been replaced with good copies. The gateway is very fine, a high, thin entrance topped with towers containing huge, ethereally smiling faces (another Angkor trademark), gazing eternally toward the four cardinal directions. The whole effect is, as it was meant to be, magnificent. You are now inside the city, a bit over a kilometre from the Bayon. This stretch of the forest is particularly delightful, with wide cleared strips on each side of the road, cool under the majestic trees. As you emerge from the trees, you come face to face with 8 or 10 huge, serenely smiling faces. You have reached the Bayon, Angkors strangest temple, with Khmer architectures most unique feature. The Bayon is at the exact heart of Angkor Thom, and thus of the Khmer empire. It is in the form of a series of square platforms rising to a central sanctuary, although lower than the temple mountains of previous generations. Its 54 towers carry over 200 huge, mysterious faces; scholars debate the meaning of the faces, which are claimed to be a Buddhist Bodhisattva or, alternatively, King Jayavarman VII, the temples grandiose builder. When viewed from a distance, the Bayon can seem a rather amorphous mass of grey, broken stone, and walking quickly round helps to bring out its three dimensions. Onward to the north, you enter a great square, flanked to the left by over 330 metres (1,000 feet) of imposing terraces, their faces finely carved with elephants, garudas and giants, and to the right by 12 pretty brick towers. The terraces fronted the royal palace and the temple of Baphuon, a great 11th Century temple mountain approached over a causeway between the snake-inhabited long grass of now-dry pools. The court must have watched the great parades and ceremonies of the empire from this terrace. Further on, the romantic cracked tower of Preah Palilay points to the sky between great trees which are deeply embedded in it, their roots probing between its joints, its destroyer and now the armature of its carcase. To the right, the beautiful ruins of the Buddhist Preah Pithu complex doze in the hot dappled light of the forest edge. The avenue out leads toward the North Gate, of similar design to the South Gate, but a quieter spot. This walk takes around 2 hours, with time to enjoy the atmosphere but no significant breaks or diversions. Breaks to explore and contemplate thoroughly can add many hours, although exploring Angkor slowly, at the pace of the people who built it, helps one fully to appreciate the extraordinary ambition and atmosphere of the place. This walk is also lovely in the late afternoon, although it is hotter. It is better done in reverse at this time of day; the slanting light through the forest is particularly beautiful, and to gaze at Angkor Wat, from Phnom Bakheng or the moatside, or perched on a ledge inside the great porch in the golden evening light, is unforgettable. ATG do a Laos and Cambodia expedition which includes delightful-sounding walks at Angkor. At the heart of the Khmer empire, at its apogee in the 12th Century, was the glorious city of Angkor, larger than any city in Europe at that time.